You’re probably asking, “I’m sorry, Taylor, but what is a hangout?? ?” Well, let me educate you folks who clearly are not from the south-eastern part of the states. Y’all probably already know that I’m from Alabama, however, when I mention I grew up on a beach I get a lot of confused looks. So here we go: Alabama has some of the prettiest beaches in the country. There, I said it! In fact, it’s on the sugar white sand overlooking clear water that I got to marry my husband. I grew up in one of those small towns dotted along the coast where only a couple thousand people actually live full time, it isn’t until spring break and summer that people really start to bombard the town. One of those weekends is a little thing called Hangout (Music) Fest. The Hangout once was a spot where people would hangout which turned into a giant restaurant that sits right on the beach in Gulf Shores, Alabama fittingly called, “The Hangout.” Not long after it popping up in town did it become a nearly overnight festival success. 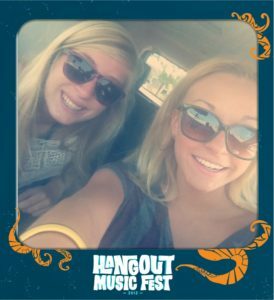 The first year I attended Hangout I was 17, I went with my best friend, Anna, and many adventures were had. 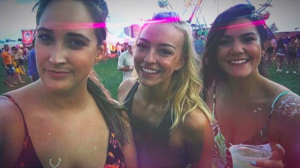 The energy there is electric and honestly how much more fun can it get than listening to good music on the beach with thousands of other people? Exactly! Off me, Ali, and Montse went in May to “Coachella but on a beach” as we phrased it to our many encounters with people who had no idea what Hangout was or that geographically Alabama had a coast. Every trip we take together, we make an effort to match in SOMETHING to the airport, hence the tanks. So what’s to expect at a huge music festival in Gulf Shores, AL? Security has gotten tighter each year and rightfully so with all the chaos in this world. Expect to pass through a metal detector and have your bag searched once and maybe even twice. Think of this like going through TSA at the airport, you can’t bring liquids over 3oz, no aerosol containers allowed. If it keeps us safe, I’m down! If you get tired of carrying around your stuff, they have lockers for rent. Lockers also include a charging port for your phones which can come in handy if you’ve been at the festival since yoga at 11:30am. Hangout allows you to bring in an empty non-glass container to refill at free water stations or your empty CamelBak. There’s a couple different spots for free water so fill it up! If you’re not used to extremely hot temperatures (and humidity), you may not realize how fast your body will get dehydrated. If you’re drinking any sort of alcohol, double your water in-take. Trust me, nothing kills a buzz faster than having to sit at the medical tent, or worse, a hospital for the remainder of the day. If you forget to bring a container to refill, you can also buy water ($5 for bottled) and keep the bottle throughout the day to refill. Help recycle while you jam! By now everyone has seen the tear-jerking video of a turtle with a straw stuck up his nose. This is unfortunately the sad reality that is our plastic filled world. You can imagine how diligent locals are about recycling then. The Hangout has a program where you carry around a green bag and fill it up with recyclables as you walk the fest. In exchange, they give you free items that are useful at the fest. Whoever recycles the most by the end of the 3days, gets 2 FREE General Admission wristbands to the following year of Hangout Fest! Leave only footprints AND get free stuff doing it?! Yes, please! There’s ample garbage cans and recycling bins available but the beach still remained covered in trash. Please do your part and just place it in a bin! Even if you aren’t down to run around and help save the planet, walk two more feet! It isn’t just an ocean hazard, it’s a barefoot people hazard too. If you lose your wristband, tough luck. It isn’t worth swapping off wristbands to fellow festival-goers either. Hangout will shut that down, FAST. Enjoy the 3 days! Everyone else has paid just as much as you have, it’s worth it! Go to the vendor booths! Take time to visit some booths in between your sets. They have some cool ones set up and most places are passing out free samples, free food, koozies, and more! They also have some neat spots to snap a few pics. Make a plan of who you want to see the MOST! Hangout has an app you can download that’ll help make your schedule a breeze. However, you may have conflicting sets and if that’s the case, I’d recommend figuring out ahead of time your game plan to see one over the other or how to see both. The bigger the band, the bigger the crowd they draw and the more people willing to camp out in front of the stage before their set. Don’t be that person who shows up as they begin and shove your way to the front where people have been waiting over an hour. It isn’t cute! Under 18? Bring a grown up! I’m not sure how much they enforced this rule but according to their website, they require all minors under 18 have to be accompanied by an adult over 21. Again, not sure if they strictly enforced it but if you’re under 18 and planning to attend, just a heads up! To shuttle or not to shuttle? Parking near the festival is a nightmare so if you’re looking to get there easily and plan to drink, I’d recommend a shuttle pass. They have a bunch of stops throughout Gulf Shores and Orange Beach, some at condos. Shuttle passes are $50 for all 3 days, a pretty sweet deal to avoid dealing with the headache of parking. Gulf Shores doesn’t have Uber or Lyft readily available yet. There’s cab companies and sometimes a random Lyft but I wouldn’t depend on it as your main transportation source. If you’re staying within a mile of the fest, you could walk. However, having grown up down there, I wouldn’t recommend it. It isn’t a walkable town even with the beach right there. People get hit by cars all the time, from speeding to DUI to just not being able to see a person in the dark down the road. It’s not worth the stress! Heat brings exhaustion and frustration. And with that brings aggravation. Don’t sweat the small stuff! Everyone is there for one purpose: to have fun. Remember, you’re at the beach, keep that laid back mentality in mind! This is something I have to remind myself of whenever I visit home in general, beach time moves slower. It also makes the days feel longer which can be a blessing at a place like Hangout Fest. If you’re interested to listen to our stories from this year’s Hangout, listen below!